Rollerblading Rocks. 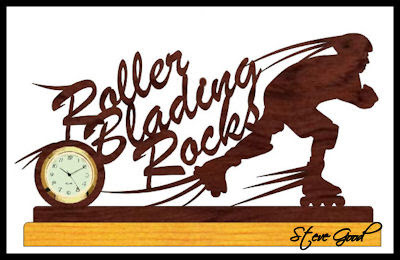 Here is another mini clock pattern for you rollerblading fans. The pattern requires a 1 7/16" mini clock insert. 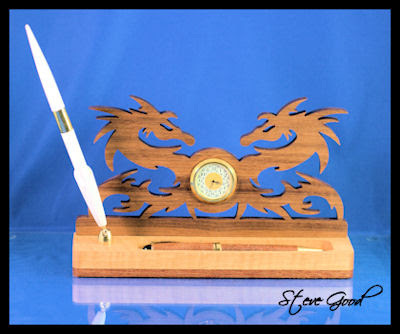 This pattern requires a 1 7/16" mini clock insert and a pen and funnel set. These parts can be found online at sites like www.clockparts.com. The base is 8 1/2" long and 2 1/2" deep there is a tray for paper clips and other small desk items. If you don't have a pen and funnel set just make the tray longer. I'm on vacation this week and the weather has been incredible here in Kentucky. The temps have been in the hi 60's and 70's. I spent most of yesterday cleaning the workshop. It always amazes me the amount of saw dust I can make. I opened the over head door and used an air compressor to blow the dust out. I thought the neighbors were going to call the fire department. I hope to spend the rest of my vacation working in the workshop. I'll see if I can come up with something to challenge you guys with. Stay tuned.